The US is going to extend its “combat operations” - the sanctions war aimed at reshaping the world - to Latin America. Tough new penalties are planned against the “troika of tyranny,” consisting of Venezuela, Cuba, and Nicaragua “in the very near future.” This announcement was made by National Security Adviser (NSA) John Bolton on Nov.1 — a few days before the US mid-term elections — in an attempt to draw more support from Hispanic voters, especially in Florida. An executive order on sanctions against Venezuela has already been signed by President Trump, but that’s just the beginning. It was rather symbolic that on the same day the NSA delivered his bellicose speech, the UN General Assembly (UNGA) voted overwhelmingly in support of a resolution calling for an end to the US economic embargo against Cuba. The document did not include amendments proposed by the US that would put pressure on Havana to improve its human-rights record. This is a prelude to a massive escalation in US foreign policy, which will include the formation of alliances, in addition to the active confrontation of those who dare to pursue policies believed to be anti-US. "The troika of tyranny in this hemisphere -- Cuba, Venezuela and Nicaragua - has finally met its match." Sounds like a declaration of war. Brazil, Colombia, Argentina, Chile, and Peru are probably some of the nations the US is eyeing for a potential alliance. Bolton’s “troika” includes only countries ruled by governments that are openly “red” or Communist. The list of nations unfriendly to the US is much longer and includes Bolivia, Ecuador, Dominica, Grenada, Uruguay, and some other states ruled by leftist governments. Andrés Obrador, the president-elect of Mexico, takes office on Dec. 1. The Mexican leader represents the country’s left wing and looks like a tough nut to crack. Outright pressure may not be helpful in this particular case. Now that this new US policy is in place, Moscow and Washington appear to have another divisive issue clouding their relationship. The “troika of tyranny” against which Washington has declared war enjoys friendly relations with Russia. With Cuba facing tougher restrictions, new opportunities are opening up that will encourage the Russian-Cuban relationship to thrive. The chairman of the Cuban State Council and Council of Ministers, Miguel Diaz-Canel Bermudez, held talks with Russian President Vladimir Putin during his official visit to Moscow Nov. 1-3. Their joint statement reaffirmed the strategic and allied relations between the two counties. Their long list of joint projects includes the deployment of a Russian GLONASS ground station in Cuba, which will give it access to a broad array of technical capabilities for satellite and telecommunications services and for taking remote readings of Earth. Russia will modernize Cuba’s railways. Sixty contracts are scheduled to be signed during President Putin’s visit to Cuba next year. Rosneft, the Russian state oil giant, has recently resumed fuel shipments to Cuba and is negotiating a major energy agreement. Military cooperation is also to get a boost. The military chiefs are to meet this month to discuss the details. Moscow is considering granting Havana €38 million for Russian arms purchases. The US-imposed restrictions are a factor spurring Russian exports to Cuba and other regional countries. When the US cut aid to Nicaragua in 2012, Russia increased its economic and military cooperation with that country. The memorandum signed between the Russian and Nicaraguan governments on May 8, 2018 states that the parties are to“mark a new step to boost political dialog” in such areas as “international security and cooperation through various international political platforms.” Russia accounts for about 90% of Nicaraguan arms and munitions imports. It has far-reaching interests in building the Nicaraguan Canal in its role as a stakeholder and partner responsible for security-related missions. President Vladimir Putin offered support for his Venezuelan counterpart Nicolas Maduro after the United States rejected his reelection in May. Russian energy giant Rosneft plays an important role in that country’s energy sector. It was Russia that came to Venezuela's rescue in 2017 with a debt-restructuring deal that prevented the default that was looming after the US sanctions were imposed. This was just another example of Moscow lending a helping hand to a Latin American nation that was facing difficult times. Russia is currently pursuing a number of commercial projects in the region, in oil, mining, nuclear energy, construction, and space services. 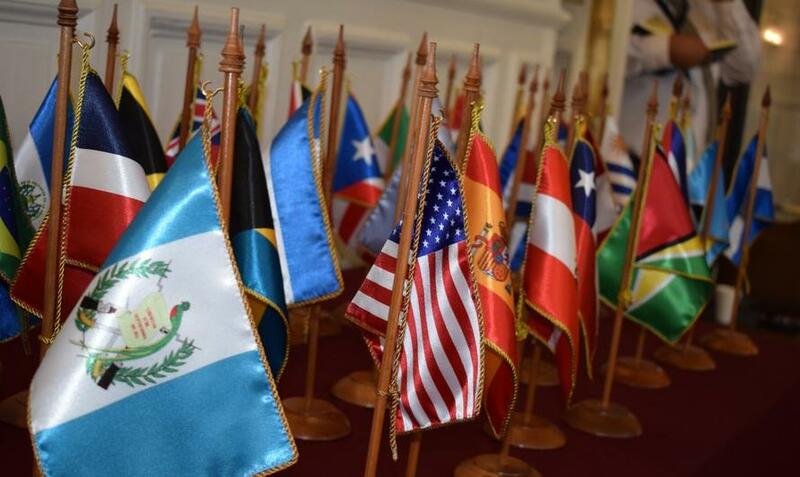 It enjoys a special relationship with the Bolivarian Alliance for the Peoples of Our America (ALBA), which was founded by Cuba and Venezuela and includes Bolivia, Ecuador, and Nicaragua, among other countries. This grouping is looking to create economic alternatives to Western-dominated financial institutions. This cooperation with Latin American nations goes far beyond ALBA. For instance, the Peruvian air force is in the process of contracting for 24 additional Mi-171s, as well as establishing a maintenance facility for their helicopters near the La Joya base in Arequipa. A contract to upgrade its aging Mig-29 fighters is under consideration. In January 2018, Russia signed a number of economic agreements with Argentina during President Macri’s visit to Moscow. All in all, trade between Russia and Latin American countries reached $14.5 bln in 2017 and is growing. RT Spanish was launched in 2009, featuring its own news presenters and programming in addition to translated content, with bureaus operating in Buenos Aires, Caracas, Havana, Los Angeles, Madrid, Managua, and Miami. Russia’s Sputnik media outlet has been broadcasting in Spanish since 2014, offering radio- and web-based news and entertainment to audiences across Latin America. Some countries may back down under the US sanctions and threats, but many will not. There’s a flip side to everything. The policy could backfire. The harder the pressure, the stronger the desire of the affected nations to diversify their international relations and resist the implementation of the Monroe doctrine that relegates them to the role of America’s backyard.